How civil asset forfeiture could be used to target North Korean funds in Chinese banks. In July, North Korea test fired a ballistic missile said to be capable of reaching the United States. Not surprisingly, Kim Jong-un’s provocations have been met with increased calls by congressional leadership and policymakers to ratchet up the pressure on China — North Korea’s lifeline to the international financial system, according to a recent UN report. A difficult question for policymakers now is how far should the United States go to increase pressure against China? In recent months, the U.S. Department of the Treasury has ramped up its efforts to identify and exclude North Korean entities from the U.S. financial system. The Treasury Department’s Office of Foreign Asset Control has designated 36 North Korea-related individuals and entities since January. Most recently, the U.S. Treasury Department issued a finding that that Bank of Dandong, a Chinese bank, is a “foreign financial institution of primary money laundering concern,” under Section 311 of the USA PATRIOT Act, for its role in facilitating North Korean access to U.S. banks. The proposed rule would require U.S. banks to ensure that Bank of Dandong does not directly or indirectly access the U.S. financial system. Amid calls for increasing pressure on China to respond to North Korea’s provocations by imposing secondary sanctions against Chinese banks, the U.S. Department of Justice (DoJ) has taken a different course of action — using civil courts. Recently, the DoJ has sued Chinese entities, in civil court, for sanctions violations. While a novel approach, is this too little, too late? In September 2016, Assistant U.S. Attorneys for the District of New Jersey filed an in rem complaint against Dandong Hongxiang Industrial Development Co., which is a Chinese-based trading company responsible for facilitating transactions on behalf of sanctioned North Korean entities. Specifically, the complaint alleges that Dandong Hongxiang, and its owner, Chinese national Ma Xiaohong, used a network of shell companies to launder transactions, as well as handle supply chain logistics, for Korea Kwangson Banking Corporation — a North Korean bank sanctioned for its role in North Korea’s WMD activities. Pursuant to civil forfeiture law, the complaint is seeking the seizure of over $74 million in funds that were routed through U.S. banks. Civil forfeiture actions in cases involving violations of the International Emergency Economic Powers Act (IEEPA), which is the statutory authority giving the president to regulate financial transactions (i.e., impose sanctions), are relatively rare occurrences. More commonly, U.S. authorities have used civil asset forfeiture to target everything from tax evaders and narco-traffickers to terrorists. According to a report by the Institute for Justice, the DoJ asset forfeiture program took in $93.7 million in 1986 compared to $4.5 billion in 2014. To be fair, 2014 was somewhat of an outlier year with several major cases, including the JPMorgan, Bernie Madoff, and Toyota forfeitures. By comparison, in 2016 the DoJ seized assets just short of $2 billion, which is more consistent with the ten-year average but still a significant overall increase. The same report concludes that civil cases make up the lion’s share of asset forfeitures — topping 87 percent from 1997 to 2013. This method used to disrupt the network is somewhat of a departure from criminal indictments, which the Justice Department has traditionally used. First, it is important to note that the DoJ filed this case in a civil court, in rem — meaning against Dandong Hongxiang’s property, not against Dandong Hongxiang. Strategically, civil forfeiture offers several benefits not available in a criminal court, which may be of particular use in a case involving overseas companies. First, the burden of proof required for a civil forfeiture judgment is significantly lower than for a criminal case. Whereas the burden of proof in a criminal case requires proof beyond a reasonable doubt, a civil case merely requires the “preponderance of evidence” — meaning, the funds are more likely than not to be connected to a crime. This “51 percent” standard is significantly lower than the required burden of proof in criminal cases. Moreover, in a civil case, the prosecutor does not have to prove that the property’s owner— Dandong Hongxiang in this case — committed the criminal violations, only that the property in question — the wire transfers — are linked to a criminal act. The second unique feature of this civil forfeiture case requires a much closer reading. In the complaint, Dandong Hongxiang facilitated several U.S.-dollar denominated wire transfers to known North Korean front companies on behalf of Korea Kwangson Banking Corporation, from accounts held overseas at ten Chinese banks, including Agricultural Bank of China and China Construction Bank — two of China’s largest banks. But, Dandong Hongxiang holds no accounts in the United States. How, then, can U.S. authorities seize assets not held in U.S. accounts? The answer comes from a rarely used section within the U.S. asset forfeiture code. First, though, it is important to understand how correspondent banking works. Correspondent banking is when one bank carries out transactions on behalf of another bank — usually a foreign bank. These relationships allow a customer at a U.S. bank to quickly send a payment to a foreign bank. How, for example, would Bank of China settle a payment from an account holder at Bank of New York? Through correspondent networks, Bank of China would debit Bank of New York’s correspondent account, and credit its client. If, say, Bank of China and Bank of New York did not have a correspondent relationship, the transaction might need to go through multiple correspondent accounts at different banks (i.e., a correspondent network). A correspondent account, then, is a bank’s account at a different institution. Although the transfers Dandong Hongxiang facilitated were initiated and deposited overseas, they were still cleared through U.S. correspondent accounts, thereby triggering both U.S. jurisdiction and sanctions. [I]f funds are deposited into an account at a foreign financial institution… and that foreign financial institution has a [correspondent] account in the United States… the funds shall be deemed to have been deposited into the [correspondent] account in the United States, and any restraining order, seizure warrant, or arrest warrant in rem regarding the funds may be served on the covered financial institution, and funds in the [correspondent] account, up to the value of the funds deposited into the account at the foreign financial institution may be restrained, seized, or arrested. This means that terrorists (and proliferators) could no longer protect their assets from U.S. authorities by hiding illicit proceeds in overseas banks. In the Dandong Hongxiang case, it does not matter that the funds are held in accounts at Chinese banks. As long as the Chinese banks have correspondent banking relationships with U.S. financial institutions (or even with other banks that have correspondent relationships with U.S. financial institutions) the assets in questions can be seized from the correspondent accounts in the United States. It is then up to the foreign bank, which in this case are the ten Chinese banks, to make themselves “whole” again by debiting from Dandong Hongxiang’s accounts. While U.S. authorities have used this type of civil forfeiture in a number of cases involving terrorism and intellectual property violations, it has only been used once before in a proliferation-related case. In 2014, prosecutors successfully seized almost $7 million of Li Fengwei’s assets, primarily held at Bank of China and Shanghai Pudong Development Bank, from a number of U.S. correspondent accounts. Li, a Chinese serial proliferator, was criminally indicted in 2014 for IEEPA and related violations. According to the indictment, Li, who currently resides in Dalian, China, was a long-time supplier to Iran’s ballistic missile program. 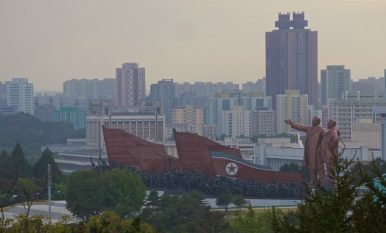 Although Dandong Hongxiang may seem like a one-off application of civil forfeiture in proliferation-related cases, consider that in mid-June, the Department of Justice released a civil forfeiture complaint against property owned by Mingzheng International Trading Limited — a North Korean front company that acted as a financial intermediary for North Korea’s state-run bank, Foreign Trade Bank (FTB). In March 2013, the United States sanctioned FTB, describing the bank as a “key node” in North Korea’s WMD proliferation activities. For its role, Mingzheng was counterparty to 20 wire transfers, totaling $1,902,976, between October and November 2015. But because each of these wire transfers passed through U.S. correspondent bank accounts, each was in violation of IEEPA and related wire fraud and money laundering violations. From a practical standpoint, criminal charges against Mingzheng and its beneficiaries would likely be a fruitless exercise. Mingzheng’s owners are never identified in the complaint, only that the company was incorporated in Hong Kong and run by “at least one Chinese national,” according to a cited confidential source. This means that either they are unknown, or that additional actions, like a criminal indictment, may be forthcoming. Either way, it is unlikely that those responsible for managing Mingzheng International Trading would ever be brought to justice in the United States. In fact, in cases like Mingzheng, extradition is exceedingly rare. Consider the case of Li Fengwei. Despite a $5 million bounty for his arrest, Li has yet to set foot in a U.S. court, despite several extradition requests and demarches to Chinese authorities. In another unique case, a U.S. court issued “peremptory seizure warrants” for transactions involving Dandong Zhicheng Metallic Material Company, an identified North Korean front. The peremptory seizure warrant permits eight identified banks in the United States to accept incoming wire transfers from Dandong Zhicheng Metallic Material Company, at which point the bank blocks the funds. Interestingly, the memorandum filed May 2017 indicates that the prosecution, at one point, also sought a civil forfeiture action, which was eventually dropped. It is unknown why the civil forfeiture action was dropped from the case. Until recently, seizing assets held overseas from correspondents accounts in the United States was viewed as a “last resort” option, largely because it was seen as potentially destabilizing. However, with the recent urgency to act against North Korea, this view may be shifting. Although under-utilized in proliferation-related cases, civil asset forfeitures can be an immensely powerful tool against North Korean front companies. Over the last six years, correspondent banking has tended to concentrate transactional volume in North America, Europe, and Asia, with U.S. banks making up a significant portion of the correspondent volume. While it is unclear if this represents a new trend, the use of civil courts to target North Korean assets is a novel approach that increases pressure on China and Chinese banks, largely without the risk of imposing secondary sanctions. From a practical standpoint, however, it is unlikely U.S. authorities can conduct enough forfeiture actions in terms of making an economic impact. But, seeing that civil forfeiture puts Chinese banks’ assets at risk, it may compel these banks to bolster their customer on-boarding and due diligence processes. Moreover, civil (or criminal) forfeiture against North Korean entities at Chinese institutions is a good intermediary strategy before imposing secondary sanctions. It targets the actual illicit funds, deprives North Korea of access to resources, and has a lower risk for retaliation against U.S. businesses and banks. Aaron Arnold is an associate with the Project on Managing the Atom at Harvard’s Kennedy School of Government and an assistant professor of public policy at Curry College. Washington should take full advantage of Kim’s renewed focus on the economy.